WORLDWIDE, FUTURE, EARTHQUAKES AND SKY SIGNS. Tanakh/ O.T. and the New Testament with quotations from N.I.V Bible. Earthquakes and Sky signs affecting the entire world. We originally wrote a similar article in October 2005, when Christian writers were linking prophecies of very spectacular Biblical signs in the sky, with naturally occurring expected eclipses close to Jewish Feast days, in 2005, and even seeing eschatological meaning in them. Their expectations of the ‘rapture’ did not eventuate, then. So what can be learnt from this in a spirit of truthfulness and humility, encouraging our faith, hope and love for God? Humility and truth are needed, and some careful reading of the Scriptures! In this article we share our belief that while future eclipses will also occur near to Jewish Feast times, (as in 2014 -2015), the 'sky signs' in Scripture are clearly fearful, spectacular, supernatural events which will be seen worldwide! ALL 'signs' given in Scripture, (not just a few) must be considered, by Watchmen, but we are not able to deal with ALL the signs in this article. >> This study is separate from another study, "EARTHQUAKES AND SKY SIGNS in JERUSALEM" which needed a separate article about that. However the serious worldwide, Endtime implications or effects of events in Jerusalem is touched on in that 'Paper', also in this one briefly. ~ See article here. 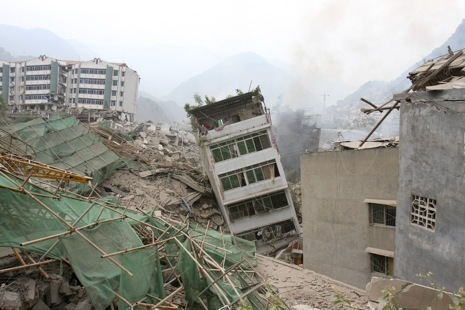 >> The study of these various, vivid, descriptions of horrendous Earthquakes is not easy! For a start it is hard to imagine the devastation and loss each one will bring. For the writers of this study we can ONLY present them exactly as the Word of God, through the prophets and Jesus Himself describes them. It is good if you look for them in a Bible and read them! >> The BIG question we have to face honestly is 'why does God allow these earthquakes to happen' and in fact some even come out of Heaven by the direction of God. E.g. the 7 'Bowls of God's Anger' in Revelation 16. Scripture gives clear answers as to why these disasters come! People may want to smudge over what the Bible says as too hard to think about, or they may try to avoid the clear basic facts given in the Bible. The reality is that ever since mankind has been on the Planet - there have been two powerful calls (or challenges) to all mankind - wanting us to make a choice for one of them. >> One call is from the High and Holy LORD, Almighty, God of love, to choose His way, which only, ever brings glorious, eternal Life. >> The other call is from Satan, the evil, rebellious, fallen angel who hates God and wants to hurt Him by seducing people to choose his own way of sin, which can only, ever result in death and destruction. Deliberate, persistent evil demands death - just as all nature demonstrates! Destructive weeds, lethal forms of plant life, or uncontrollable excessive animal life, (such as poisonous snakes, man-eating sharks or crocodiles) rotten fruit, dead matter and filth of every kind, dangerous substances, etc, demand to be destroyed. 'Rubbish' is destroyed. Death and decay demand destruction. This is the clearly described outcome for SIN - our deliberate rebellion against the true God. It is called 'death'. "Do not be afraid of those who kill the body, but cannot kill the soul." > Discerning exactly when some of the huge Earthquakes will happen, or if two (or more) separate descriptions in the Bible are about the same Earthquake, is difficult, if not impossible with our tiny minds. Only God knows all the secrets of His timetable. Our part is to TRUST Him, and be ready to meet Him, and help others while we watch and wait! In some cases, we do make a suggestion, if it seems an Earthquake is before the Tribulation, (which is a 7 year period of Satan's cruel rule on Earth), or if it is likely it is at the very end, just as Yeshua/ Jesus actually Returns to this Earth to be King over it. >So it seems important to match up the timing of the seven Biblical events of Major Earthquakes, with an understanding of 'The Great Tribulation', as there will be an Earthquake in Jerusalem, after the first 3.5 years of the Beasts 7year "Treaty (or Covenant) with many", as given in Daniel 9:27, and explained in places such as 2 Thess. 1: 7 - 10 & 2: 4 & Rev. 11: 13. We give more details in the 'Full Israel/M.E. Timeline'. >> ALL the Endtime events are very sad and seemingly very severe. The so called 'natural disasters' we are already seeing in the first decades of the 21st C, are the 'beginning of birth pangs' coming on the world with good Christians, still in the world, who will suffer later from persecution, (just like is already happening in MANY places). However some Christians will suffer with many people from the terrible 'Endtime' disasters as well, (such as described in Revelation chapters, 6, 8 & 9, 16 - 18), but allowed by God as the direct result of deliberate sinful rejection - by entire nations - of the true God of Heaven. Sadly, as always, the innocent, often suffer with the guilty. This has been true ever since the Great Flood, although for anyone older than 7, there is always Eternal Salvation for those who trust in God's Sacrifice by faith in Jesus. Have you taught your children about Jesus? >> Whatever our tiny minds might think about terrifying events~ it is the Word of The Almighty GOD of the universe, the Holy One of Israel, the Eternal God alone - that matters! However it is going to be very hard to risk our lives as genuine Gentile Believers, to be true to God and His Son, Jesus/ Yeshua/ El Maseeh during these future years. But 'Over-comers' by trust in the Lord Jesus Messiah, will be glorified! Yeshua/ Jesus "endured the cross... for the Joy that was set before Him", so we too should look at the Glory promised, more than the pain. This is the real answer to many questions about their past 2,000 years. Many Christians find this hard to believe but we invite you to study our article, "Israel's Glorious Future", and the "Sequel to the Ezekiel war". NOTES ON SEVEN SPECTACULAR, SCRIPTURAL,‘UN-EARTHLY’, WORLDWIDE EVENTS ASSOCIATED WITH THE FUTURE. We now consider Biblical prophecies of Earthquakes and Sky signs affecting the entire world and even 'space'. These are terrifying and unique events! Note 1. For a number of years Bible Believing Watchmen have commented on various significant astronomical events, especially in the sun and the moon. But a humble attitude to these, associated with other foretold events is needed, especially being wary of giving firm dates for big prophetic events. Note 2. We are right as ‘watchmen’ to consider changes in our universe. However it is the worldwide, un-natural changes, which are ‘signs’, of the End of the Age and Messiah’s Coming to Earth, not localised, brief eclipses, or near misses of asteroids, etc. >> One of the biggest lies of the Endtime is regarding the Earth. - 'Humanism' questions its origin, and it's future - being in danger, but not because of the real reason: mankind's sin, let alone any Sovereign acts of the Great God of the Universe! Even knowing Who God is - they reject Him. >> People will believe these lies, (of over-population and wrong use of Earth's resources) because they do not want to believe the TRUTH, even though God says, "the world will know that I AM GOD". So severe Disasters are caused by rebellion and sin against God and His Biblical guidelines. Note 4. With very much modern knowledge about 'Space' and especially Earth as part of our small Galaxy, and our sun (really a 'star') and our 9 planets and (in Ancient times) our 'single' moon; we still need to consider the Biblical references in the light of the knowledge that the Prophets had, - (and Jesus /Yeshua also confined Himself to), regarding the knowledge of that time, long before modern technology, (like massive telescopes or even space satellites) to search beyond what human eyes can see, unaided. Never 3 hours of un-natural darkness as at the time of Jesus' death, as reported by Matthew in ch. 27:45, from 12 midday to 3pm in modern time. Note 6. Throughout Scripture there are a number of prophecies of Earthquakes and sky signs that were for the Prophets own times or near future. These are Ezekiel 32: 7 &8, regarding Egypt; Amos before the Exile for Israel as part of the Assyrian invasion in 722, and Micah 3: 6 regarding the Exile of Judah in 586BC. However it takes careful reading and helpful Bible Study notes often, to understand who and when the prophecies were meant for. Note 7. In Amos 5: 18 and 8: 9, the prophet spells out the awful reality of God's judgements on the people of his time because of Israel's utter sinfulness. "In that Day", declares the Sovereign LORD, 'I will make the sun go down at noon, and darken the Earth in broad daylight'." The Prophetic Biblical explanations frequently refer to times of darkness due to God's Hand 'striking the sources of light for this world'. a) Because Scripture often does not make the events clear as to their timing, the principle of possible double prophetic fulfilments, or partial fulfilments has to be remembered. An example in this possibility is in Amos 8:9. This chapter is clearly being addressed to Israel, before the Exile when they were living in the Land and the Temple in Jerusalem was still in use (though falsely!) So Amos's prophecy was firstly, for that time. The LORD is speaking of the terrible cruelty, dishonesty and false worship, then He says, "The Lord has sworn by the Pride of Jacob (Himself) 'I will never forget anything they have done. Will not the Land tremble for this...? Israel was punished then. b) However it had a second fulfilment - future to his day (but in our past): "In that day the sun will go down at noon and darken the Earth in broad daylight'..." This more serious fulfilment for 3 hours was on the day that God's Son died in Jerusalem; see Matthew 27: 45 -51. Long periods of darkness will also have further serious fulfilments as part of the Endtime events as we mention later. It takes careful reading of all the prophecies to discern when the Prophet's gaze was lengthened to see - beyond their present times - to the End Times, which we are concerned with in this study. Prayerful reliance on God's Holy Spirit for reading or sharing is absolutely essential. It is essential to ask, "Has this prophecy ever happened yet?" Our words and descriptions in this article and others, is for your own study to decide what God is saying. We do respect other points of views, but have to "agree to differ" on some different beliefs. ALSO "SHAKING OF THE EARTH AND SKY" = EARTHQUAKES. SUMMARY OF how these Scriptures of the 7 Quakes being studied now, ARE HANDLED. B. FOUR separate descriptions of one huge, Last Day event, synonymous with Armageddon? + Plus ONE special Earthquake in Jerusalem (only), halfway through the 7yr. Tribulation period, but we write about this at the end of the study. > Note: We cannot say specifically in what time frame, (i.e. dates, within the total Endtime period) these will happen, but we do make some suggestions, or give alternatives for you to consider. > As mentioned, Prophetic Events can have two fulfilments or a partial one with a more complete one to come, as illustrated above. > These 7 Prophetic Scriptures are clearly speaking of still future events, which have not happened yet. Therefore we may live to see some of them. We now list the references to the special, future 'God directed Events' foretold in the Bible, with our added notes on them for you to consider for yourself. MAIN SECTION A: A GREAT EARTHQUKE BEFORE THE TIME OF TRIBULATION. Two possible descriptions of this one world-changing serious Event! OF A GREAT, WORLDWIDE 'CHANGING' EARTHQUAKE. 1. 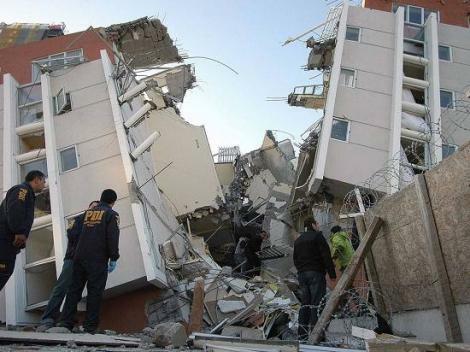 Ezekiel 38: 17 - 23 is a very specific prophecy of an Earthquake, centered in the M.E, which we believe could be the first of the seven world-shaking Quakes to occur. It will be centered in Syria in the scenario of events describing what must be God's answer to a mainly Muslim huge Army determined to annihilate Israel. The Army is under the leadership of 'Gog' and all the details are clearly given in chapter 38, with GOD's reaction from verse 17: "This is what the Sovereign LORD says, 'Are you not the one I spoke of in former days... This what will happen in that Day; when Gog attacks the land of Israel, My hot anger will be aroused', declares the Sovereign LORD. 'In My zeal and fiery wrath I declare that at that time there shall be a great earthquake in the Land of Israel. The fish of the sea, the birds of the air, the beasts of the field, every creature that moves along the ground and all the people on the face of the Earth will tremble at My Presence. The mountains will be overturned, the cliffs will crumble and every wall * will fall to the ground. 'I will pour down torrents of rain, hailstones and burning sulphur on him and on his troops and all the nations with him. So I will show My greatness and My holiness, and I will make Myself known in the sight of many nations. THEN they will know that I AM the LORD'." It is important to stop and think carefully about this. An earthquake - as God's weapon of war! >> This will affect the entire world [even though it is only one army called 'Magog' - one Group of nations involved] economically and in every other way! [* Maybe one 'wall' that falls is 'Wall St'?] Please see notes below*. >> This is not 'Armageddon', which will come more than 7 years later on, with all Nations involved. Revelation 16: 14, Isaiah 13: 4 - 13. >> Jewish people will never be the same again, but will become a true God- fearing, Yeshua worshipping, Holy Nation with the Ruach ha Kodesh poured out on them. See Ezekiel 39: 29 and our article here. >> After this Quake could be when the world chooses to come under the 'Beast' of Revelation, or one called the * 'Anti-christ' by most Bible Teachers, but we prefer the name, 'the False-messiah'. >> It seems that in a sense this will be God's last, clear, word to everyone on Earth giving an opportunity to turn to Him, as very many will ~ we believe ~ as in Isaiah 49: 26 - (2nd half of verse), Romans 11: 12 & 15 indicates. Ezekiel says "then they will know that I AM ADONAI~ The LORD." Ezekiel 38: 23, 39: 5 - 7. 2. So Revelation 6: 12 -14 is the next specific reference. It is all about an event coming one Day, involving the breaking of the 6th Seal, by the Nail-pierced Hands of the Son of God Himself. A most frightening seismic event for the whole world in the future ~ so destructive it will, (we believe) change the rulership of the Earth in tragic ways, bringing the anti-christ out, (* as written above), after it has passed. a) God's Part. “Then I watched as He broke the 6th Seal, and there was a great earthquake, * the sun turned black as sackcloth worn in mourning, [a rough goatskin cloak,] and the full moon became blood red, and the stars in the sky fell to earth, as late figs drop from a fig tree when shaken by a strong wind. The sky [will be seen] receding like a scroll rolling up, and every mountain and island was removed from its place!” [Square brackets indicate the writer's notes.] Compare notes below - Re Ezekiel 38: 4! Our note. We believe this * describes the same event when the Magog Army comes against Israel, and so it can be compared with the previous Scripture description from Ezekiel 38, as it is such a serious event both in the happening and man-kind's reaction to it! Ezekiel is focusing mainly on Israel, but verse 20 includes these words, "all the people on the face of the Earth will tremble at My Presence." As one who has experienced a few 'severe' earthquakes, I know the trembling of one's whole body can last for some time - and this reaction is well described here! Note: "ALL the people... will tremble." Earthquakes are clearly allowed by God at His choice of time, not man's! [We believe this possible timing, (as being identical to the Ezekiel 38 scenario). ~ but you are invited to study this or see here. b) Man's Part. [This synonymous Quake, could even happen around 2016, when the next 50th year of Jewish Jubilees are counted by some. Note also it is NOT at the Second Coming yet.] Clearly the 'twin event' of Ezekiel 38/39 - (with this huge Earthquake, in Revelation) is described are being organised by the Anti-Israel, Anti-God Islamic/ Russian-led bloc, that assembles the 'Magog Army'. At the right Time God allows evil to happen, - then He reacts, Eze. 38: 4. There are 2 reasons for this event, (which totally destroys the Magog Army). 1. This earthquake will result in economic collapse of the entire world. 2. But the main reason of this act of God is to deliver Israel from annihilation and cause them to call on Him as their Saviour and God alone. Ezekiel 39: 29 says it clearly. "'I will no longer hide My Face, [Yeshua/ Jesus] from them, for I will pour out My spirit on the House of Israel', declares the Sovereign LORD'." By turning to their own God and Messianic Saviour, Yeshua, Israel will become a unique, holy Nation partly through seeing God's severe punishment of Islam! This has been ADONAI'S greatest desire, since His call to Abraham! Gen. 12. MAIN SECTION B. FOUR OTHER EARTHQUAKES AND SKY SIGNS AT THE END OF MAN'S RULE. Notes about the phrase 'In that Day' referring to specific (long) 'time slots'. = 8 separate 'Days' in total. Our suggestion is: -that the 7th & 8th ‘Days’, could be the Days of judgement * of the Earth during the final out-pouring of the 6th & 7th ‘Bowls of God’s Anger’, at the time of the ‘Battle of Armageddon’, which is * “The Day, the cruel Day.” This very last Day of man's rule is described in four places in Scripture. It is: "To make the Earth desolate" (not to destroy the Earth), but to~ "destroy the sinners within it"! Mankind has been warned! For all 8 periods, called the 'Day of the LORD' or 'In That Day'- they are also outlined in a separate article. See here. Therefore, it is possible that: there are several descriptions of the same FINAL EARTHQUAKE ~ AT THE TIME OF THE RETURN OF MESSIAH JESUS, ~ ALSO CALLED: "THE DAY OF THE LORD"
ONE PROPHECY, [of 4] ~ ISAIAH'S PROPHECY IS THE MOST ANCIENT ~ ABOUT A WORLD WIDE FINAL EARTHQUAKE! Isaiah 13:10. However we know from verses 9 -13 it is clearly a Prophecy for the entire Earth in a future time, the last and greatest shaking, by an 'earthquake', a Day of judgement to destroy the False-messiah's kingdom of 'Babylon' - SO synonymous with Armageddon -exactly when, no one knows. See more below. Prayerfully use your imagination as you read verse 10 again. Note 2. No wonder in another place it tells of roaring sea waves, (Luke 21: 25) as the moon controls the tides. So this prophecy of Isaiah matches Jesus words below, also John's Revelations about the Time of the "Bowls of Wrath", [Rev. 16] after the Tribulation and just before the Coming of Jesus/ Yeshua as "Son of Man". Yet Isaiah wrote these words 2,700 years ago! Note 3. It is very wrong for false modern prophets to announce, "the World will end" on a certain date. This is partly because ~ like the boy who shouted a distress call of "wolf, wolf" when there was no danger - it causes people to belittle, deride and ignore the true warnings of Scripture. Very sad! SECOND PROPHECY. YESHUA, THE GREATEST PROPHET OF ALL DESCRIBED THE SAME EVENT AND TIMING. Jesus Messiah’s words in Matthew 24:29. Note 1. This event is clearly described by Jesus as after ('post') the 7 year Tribulation time, sometimes called 'the Time of Distress' *. [But we cannot resist pointing out that Jesus indicated the same people who live past that serious event will also see the Resurrection-rapture at the Coming of Yeshua!] "Immediately after the distress of those days" = ('Post-tribulation teaching by Yeshua Himself,) when He then says: "They will see the Son of Man Coming... with power and great glory!" Vs 30, the timing is so clear! Note 2. This description in verse 29 is clearly about an unusual set of events - not normal 'cyclical' events like a lunar or solar eclipse, but rather strange and devastating calamities in the sky. It would seem the whole of our universe and even ‘space’ is involved! ["Stars will fall from the sky and the Heavenly bodies will shake."] Christian scientists of repute believe that the Earth suffered in a serious event – perhaps like this – at the time of the Flood [Genesis 6 -8] and the result subsequently - caused the whole Globe's revolutions to change radically, also the Earth to became 'tilted'. One effect was: totally different weather patterns from before the Flood, when there was no wind, rain, snow or hail, so future shaking will also have marked effects on our Earthly Globe, but just what kind we cannot completely describe, but the Returning King of Kings, and Creation will Re-create it perfectly! Note 3.The reference to "stars falling from the sky" could well be asteroids, or even other celestial bodies such as have now been revealed by pictures taken by the 'Hubble Space Explorer'. See here. PROPHECY THREE. THE PROPHET JOEL'S DESCRIPTION OF THE SAME, LAST EVENT. > Two references to spiritual Revival in Israel. [As one studies all the Earthquakes and sky signs, near the Return of Yeshua/ Jesus - at the end of the world, the Earthquakes are clearly God's way of fighting these powerful evil Forces so they virtually become one act, that could be - 'Armageddon'.] See what you think as you read it. > So the first description of revival for Israel, in chapter 2: 28 -29, [after a description of a huge Locust attack] Joel writes God's words, about a wonderful time of Jewish revival; "And afterward, I will pour out My spirit on all [My] people...."
Incidentally Joel continues in chapter (3) from verse 1 and explains more. > The timing of the final, last severe punishment against Israel's ~ and ~ God's own enemies, is indicated by his one sentence ~ a 'time' statement about Israel (by two descriptive names!) So maybe this is a third description of the same Quake as in Ezekiel 39, and Revelation 6: 12 at the Breaking of the 6th Seal. Hope this doesn't confuse you, but sorting out the sequences and times is hard. "In those days and at that time, when I restore the fortunes of Judah and Jerusalem..."
This time "when" ~ is probably a mere 7 + years earlier as we have described in the first section, (above) regarding the Events of Ezekiel 38/39 of the "Magog War" and huge Quake that destroys the Islamic army, at which time (in verses 39: 26 - 39) God restores gloriously all Jews to Himself and the Land! Please read Ezekiel 39: 25 - 39 again, for yourself or see here. Also in chapter 3: 2 - 8 Joel also explains what is behind God's Acts. > Main reasons for God's plans are the serious and evil treatment against God's own Jewish people. > Now Joel makes his second reference to revival in Israel. In ch.2, (last verse 32) Joel reverts to another description of the same revival and the consequences for the Jews. "And everyone who calls on the name of the LORD will be saved, for on Mount Zion and Jerusalem there will be deliverance, as the LORD has said... whom the LORD calls." Then it goes on to the beginning of the next chapter (3:1) ~ God speaking: "In those days and at that time when I restore the fortunes of Judah and Jerusalem..."
>>> Joel's next explanation includes the conduct of war, (as in ch. 2) possibly Armageddon. >>> Later, [ch3: 9] Joel gives another description of 'Armageddon' the last, great, Endtime, War - (WW3), just before Jesus'/ Yeshua's Return to destroy the False-messiah's Army and destroy him, (the Anti-christ), and the False-Prophet (as in Rev. 19: 17 - 21! Note: the members of the world's armies, all with the mark of the Beast, will choose to come against God in this final Battle. So it would seem a simple thing for God to use so called 'Nature', that they have been worshipping as 'Gaia' ~ "Mother Earth" ~ to punish them! “For the Day of the LORD is near in the ‘Valley of Decision’ – the sun and the moon will be darkened and the stars no longer shine. This is surely the final battle against God's People at 'Armageddon' that will end with the Royal Messiah Jesus, Returning to Earth to vanquish evil as described in Revelation 19: 15 & 21 by the authoritative 'sword (word) out of the mouth of King of kings', "with which to strike down the nation... He treads the winepress of the fury of the wrath of God Almighty!" So the Huge Storm and Earthquake are only part of this event, our Rapture to meet Yeshua, is the other part! Next is the fourth reference which is in Revelation 16:16 - 21 will complete the terrifying set of four descriptions of one event, as we outline below. EXTRA NOTE. HOW THE APOSTLE PETER REFERRED TO JOEL'S PROPHECY. Note 2. Later, He did go on to quote verses 30 & 31, which did not apply to the Day of 'Pentecost', when he was explaining these other significant events! This is an example to us of knowing when there are two parts of one or two verses close together, with two separate parts of fulfilments of a prophecy. Sometimes as in this example there are thousands of years between. So it is very important when reading a prophecy to ask, "has this happened?" There was a great event on that first fulfillment, we call the Day of Shavuot/ Pentecost, but it was not in the skies! It was the wonderful fulfillment in part only –of the spiritual effect of the coming of the Holy Spirit - Ruach Ha Kodesh - of God on the 120 Jewish people who had waited for this Day as Yeshua had asked them to. Initially small tongues of flame rested on each of 120 Believers as they prayed, and then they found they could speak other, specific, Earthly languages! Therefore Peter in his first evangelistic sermon, remembered the words of Joel chapter 2. It was because of the amazing experience they had just known, “Suddenly there came a sound from the sky like the roar of a violent wind, and it filled the whole building where they were sitting. Then they saw what looked like tongues of fire, which separated and came to rest on each one of them". They were all filled with the Ruach Ha Kodesh [Holy Spirit] and began to talk in different [human] languages as the Spirit enabled them to speak.” As a result, the true Nation/ Family or "Kingdom of God" was born when 3,000 Jewish people by repentance and trust accepted the Messiah! by repentance and faith in Jesus? >> Now Peter was explaining to the huge crowd of several thousand people, what God was doing as a result of people believing in God’s Holy Son, and repenting and confessing that it was for their sin that God allowed Yeshua/ Jesus to be crucified, but had also raised Him from the dead, so that now He was the victorious Messiah in the Presence of God, in Heaven! >> So this was 'that Day' and this account of the 'birth' of God's Kingdom on Earth, (also called "The Church") is one of the most exciting chapters in the Bible! New spiritual Life, for 3,000 Jewish people first, then thousands more later, and finally, gradually Gentile Believers were joined to them, as Acts 15 records. So the LORD’S call to repentance (12- 17) and the LORD’s promises of blessings for ISRAEL came almost 2,000 years ago, well BEFORE "the great and terrible Day of the LORD." [Acts 2: 20]. "The great and terrible day of the LORD," will still come true in our future, exactly as foretold. PROPHECY FOUR. THE GRAPHIC DESCRIPTION IN REVELATION OF GOD'S FINAL SCENARIO AGAINST EVIL! In Revelation 16: 17, John matches - three other prophesies -Isaiah's Prophecy in ch 13, Joel's Prophecies, (linked to the N.T.) ~ and Jesus'/Yeshua's prophecy in Matt. 24:29! SO, Revelation 16: 16 - 21, is a detailed horrific description of the last Earthquake for this evil world! > This is when the whole Earth and sky will tremble! So the final storm is also vividly described there as being initiated by the 7th Angel pouring out His 'Bowl of (God's) wrath'. However it comes a few chapters before the time given in Rev. 19: 17 -21. > It is possible it matches with the 7th Trumpet, because the last half of the last of verse of Rev. 11 says "and there came flashes of lightening, rumblings, peals of thunder, and an Earthquake and a great hailstorm." > The same background reason in Rev. 16, verse 16 explains the actions of the Anti-Christ Beast and the False Prophet who now with amazing arrogance, call the nations to a huge battle to fight against God and the Believers in Jesus! "Then they gathered the kings [rulers] together to the place [a flat plain in Israel] that in Hebrew is 'Ha Megiddo'," [in English 'Armageddon'.] We believe this description here in chapter 16, is a 'flash forward film' (if you like), of the total event described in Revelation ch.19: 17 -21, as mentioned above. SO, A MAJOR EARTHQUAKE IS THE SAME WORLD-ENDING EVENT, AT THE SAME TIME AS THE RETURN OF OUR LORD JESUS, 'WORD OF GOD' ~ TO EARTH! So here is the description in chapter 16, emphasising the destruction of the Beast's world system called by the name of his 'Capital City' - 'BABYLON'! "The seventh angel poured out his bowl in the air, and out of the Temple came a loud voice from the Throne saying, 'It is done'! Then there came flashes of lightening, rumblings, peals of thunder and a severe earthquake, NO earthquake like it has ever occurred since man has been on Earth - so tremendous was the Quake! The great City, split into three parts, and the cities of the nations collapsed. "Every island fled away and the mountains could not be found. From the sky huge hailstones of about 100 pounds each fell upon men. And they cursed God on account of the hail, because the plague was so terrible." EXTRA: OUR NOTES ON 'ARMAGEDDON' ~ AND EARTHQUAKE ~ COMBINED. > As we've suggested this piece of Rev 16, could be a 'flash-forward picture' in Revelation - before it goes on to explain many other things, in the next 2 chapters, about 'Babylon', Satan's City! > Rev. 17 depicts 'Babylon' as a garish Prostitute, riding the Beast, and other more detailed descriptions in the whole of chapter 17. > Chapter 18 puts the cameras on the destruction of the City of Babylon, and the reaction of those who gloried in her power and horrific trade. > BUT on the other hand the perspective from Heaven is announced in ch.18: 4 - 8, ending with the words: "Mighty is the LORD God who judges her," (therefore the detailed account of her ruin is given in the whole of ch. 18, ending with the tragic reason for her punishment, the deaths of many saints! > Revelation 19: 17 - 21, gives the actual final end, and cataclysmic set of events for the Beast and the False prophet and all people - with his mark - "are thrown alive into the fiery lake of burning sulphur." Believers should note it! NOTE, we want to emphasise, we do not know the timing of any event exactly, but we believe God has placed these prophecies in the Bible for our warning - to prepare us Believers for His total acts of justice. What we can be sure of is: “He will be faithful and just to forgive us our sins, if we confess them to Him” in repentance, and accept His Son’s death in our place. [1 John 1:9.] Then we can be sure of our Place with Him one Day especially on the Last Day of His Return! THE SIGNIFICANCE OF ALL THESE ENDTIME EVENTS IS TWO-FOLD. 1. It would seem to emphasise what we already know, that ADONAI, the God of the Bible, and the Holy One of Israel is also ‘The Potentate of Time’. He alone is the great Eternal God of Creation who also sustains the Earth! Yet God alone has the right to also destroy what He has made! Only HE can determine the timing of small or great ‘natural’ events such as Earthquakes or the movements of the stars and planets, and our moon. No human power can control the movements of our great ‘star’ we call the sun, nor of the moon that circles the Earth at exact times and distances! 2. So-called ‘Natural Disasters’, we believe, are not always sent by God, (though some in the days of the Bible were, and in the final End Times will be), but He also allows disasters such as hurricanes, tornadoes, earthquakes or torrential rains or droughts, part of the suffering brought by sin’s entry. These are called "the beginning of sorrows" ~ the first "Birth-pangs" - [called the 'First Stage by Obstetricians, the Second Stage is severe and ends with the actual birth.] Therefore the ferocity and increased frequency of extreme weather and other events must be significant! These can even happen in Israel although earthquakes, torrential rain, or droughts, (though not without their problems), have not been as disastrous as in other places, in the world. God loves Israel! 3. BUT GOD will send the judgements that all mankind deserves for it's repeated, deliberate rebellion against the Holy God of Heaven, also its treatment of God's People, Jews and Christians. SPECIAL SECTION: A GREAT SIGNIFICANT EARTHQUAKE IN JERUSALEM. For a full study on the subject and time, please see here. This event happens, between the Ezekiel Magog war and the final End-time earthquakes that take place at Armageddon. This is the 7th major Scripture we are studying. So the Scriptures do tell us of a future very serious events for Israel which we will now consider. >Our conclusion is that these tragic forces of the Earthquakes are not all sent by God, but allowed by Him, above all, to turn our thoughts to Him and the destiny of each life with, or without Him! He longs for each one of us to “call on His Name in repentance and trust in His way of being saved”. It is well explained in the letter to the ‘Romans’, (10 & 11) in the N.T. Please read it for yourself! You do not need to be hurt by the last big Quake, (see later notes). 'Now' is God's time for blessing! These FACTS need to be humbly acknowledged and bring us to our knees often in worship of ADONAI, but also that they may be used to bring some people to know God. Will anyone look at us and say, 'you never told me'? Please note, though we have written some notes about worldwide Biblical Earthquakes in the future, we can see that one specific earthquake will happen in Jerusalem, as described in Revelation chapter 11, probably only in Jerusalem. Therefore it is right for Jewish Believers to consider this, about Jerusalem. Though it is local to this City, the effects are serious for the World! Does Scripture give any specific prophetic details of a future earthquake in Jerusalem? YES! A very significant Scripture in Revelation 11: 13 gives amazing detail of a horrific event in Jerusalem, in the future, at the time of the False-messiah’s (Antichrist’s) world rulership. This is because of the context of other events! > Rev. 8 starts with a mysterious insight into Heaven where, (vs. 5) "incense was mixed with the prayers of the saints" and after being offered on the golden altar, then an angel "hurled it down on the Earth, and there came peals of thunder, rumblings, flashes of lightening and an earthquake." When this happens we cannot be sure, except that it is after the opening of the 7th Seal, which is not until ch. 8. [Chapter 7, though it is given before the Tribulation - it is a special vision of Believers during the Tribulation. Jewish sealed servants on Earth (not evangelists we believe, but ministering to persecuted Christians) - and Christian saints who come out of the Tribulation, and seen as Victorious!] What we call a "Flash-forward video" of events. >The very important ministry of God's Prophetic Witnesses [Rev.11] in Jerusalem, (it seems) will harmonise with the first 4 'Trumpet' devastating events, [Rev. 8] affecting one third of the Earth each time, causing the Prophets to be hated and finally killed, by Satan who at that point takes possession of the Ant-christ beast, [Rev. 11: 7]. >This set of events you can read there, (the killing of the 2 Prophets by Satan - re-incarnated in the 'Beast' Anti-christ) sets off another significant Earthquake, but only in the City Jerusalem, where the Temple has been rebuilt to worship Yeshua. It is not hard to imagine the headlines describing this event! HUGE EARTHQUAKE IN JERUSALEM, ISRAEL. ONE TENTH OF THE CITY DESTROYED. Death toll tops 7000, thousands more injured. Previous days of celebration turn to shock and confusion. This is the event described in Revelation chapter 11: 13. ALL the above reminds Bible Reading Believers ~ to believe God's Power can over-rule Evil ~ for Ultimate good and the Glory of His own Name! We do not need to throw up our hands in any sense of defeat nor should we plead ignorance of God’s over-all Plans for His own Jewish People! We simply MUST stand with the prophet Habakkuk, who having seen the sovereignty of God on behalf of His Jewish People ~ accepted what God was allowing. [See a more complete study of this here. In this incident - notice - it followed the martyrdom of the two godly Prophets. > God will not fail to bless Israel or to act at the right moment on their behalf! VERY SERIOUS EVENTS, ESPECIALLY THE EARTHQUAKES DESCRIBED. 1. Special conclusions for Jewish Messianic Believers and friends in Israel. > Jerusalem is God’s chosen City, for which He alone is responsible. > Each specific description in Ezekiel 39/39 and the 11th chapter of Revelation have serious meanings of blessings, and evil is punished. > These events are available for anyone ~ especially with a love for Jerusalem ~ to know and pray about. 2. Special conclusions for Gentile Christians from the whole world. > End Time saints will rightly rejoice at the overthrow of all evil, as many will have suffered in it! Key points for all Believers, Jews and Gentiles, to remember. > Only the true God of Heaven, can foretell and depict clearly events in the future. > All the terrible events are known to God and only allowed because of man's free-will deliberate choice to rebel against God and His Truth. > Notice too, the time of Tribulation for the world ~ with Gentile Christians in it when under the Antichrist ~ is of special concern to God, who knows exactly how many Believers there are. [Romans 11:26.] People who take the 'worship mark' of the Beast will not want to, nor be able to turn to Jesus. > God has always been very slow to anger, as the time factors reported here shows. Remember Prophecies in the Tanakh - over 2,700 years ago, and Yeshua's and John's (the writer of Revelation) almost 2,000 years ago? > But in the right time, before the whole world - God will act very decisively. >God’s GLORY will be made known and seen to be just - to the very end. >Only God's true people will sing praises to HIM for His justice over evil. But NOW we pray for Israel and thousands of people, including Middle Easterners to know God and Jesus/ Yeshua/ El Massih as their own Saviour from sin. about the four serious prophecies of Armageddon and the final devastating Earthquakes and Storms written about above! WHERE WILL ALL TRUE JEWISH AND GENTILE BELIEVERS BE DURING THE LAST HORRIFIC ARMAGEDDON WAR AND EARTHQUAKES? Here is a clue in Rev 16: 15, (the last verse before the description of that horrific scenario - 16 - 21... in the Living Bible.) "Take note! I will come as unexpectedly as a thief. Blessed are all who are awaiting Me, who keep their robes in readiness and will not need to walk naked and ashamed." Armageddon - a terrible WW3, is not for Believers - who will be caught up to meet with Immanuel IMMEDIATELY BEFORE IT! So we come to the end of this long and complicated, but valuable, study. Again, we do not write these studies to be ‘right’ about events of the future, but to those who will receive these thoughts, we would like them to be greatly encouraging! You see, yes, we do believe in a ‘Post-tribulation Coming of Yeshua/ Jesus’, but not without real joyful hope for all Jewish people, and many Gentile Believers who love them and are supporting and praying for them now. We also plead for (often persecuted) Believers in present Muslim Nations. We are among many thousands who do this. Read Psalm/ Tehellim 125! We thank you for reading this study and invite you to comment, question or criticise it to us in love. "...YOU will be counted worthy of the Kingdom of God, for which you are suffering. God is just: He will pay back trouble to those who trouble you and give relief to you who are troubled, and to us as well. THIS WILL HAPPEN WHEN THE LORD JESUS IS REVEALED from Heaven in blazing fire with His powerful angels. He will punish those who do not know God and do not obey the Gospel of our LORD Jesus. They will be punished with everlasting destruction and shut out from the presence of the LORD and from the majesty of His power. On that Day He comes to be glorified in His holy People, and to be marveled at among all those who have believed. This includes you who believed [Paul's] testimony to you. With this in mind we constantly pray for you, that our God may count you worthy of His calling and that by His power He may fulfill every good purpose of yours and ever act prompted by your faith. We pray this so that the Name of the LORD Jesus may be glorified in YOU, and you in Him, according to the grace of our God and the LORD Jesus Christ." Paul wrote these long, lovely sentences to the Thessalonians in ch.1: 5 - 12!